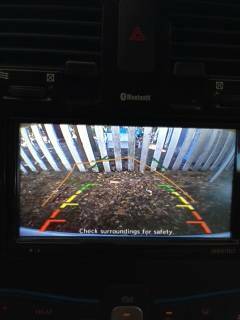 I added a wireless backup camera to my wife's 2013 SV, easy and cheap, I checked the wireless and compared it to wired before I installed it and could tell no difference. There is a little wiring, no soldering needed, and no wires run from the front to the back of the car. As you can see, camera is nearly invisible. a little wire to make ground lead, etc. 2. at lower edge of panel pull with hands back, lower edge will come loose. 5. remove small harness at top of panel going to the emergency blinker switch between the vents. 7. use wire cutters cut the protective taping around the wires so that you have about 2" of wire exposed. Do not cut any wires. 8. use solderless connector to attach center wire from your new female RCA jack (that you cut off an old video cable) to the red wire at the left corner. 9. similarly the shield wire of the RCA Jack goes to black wire next to the red one at the left. 10. Identify the 3rd black wire from the left, this is the trigger wire that tells the radio to display the back up view. Cut this wire about 2" from the plug. Use a solderless connector to attach a 10 inch wire to the 2 inch stub coming out of the plug, this extension will be attached to ground later. Tape the end that is still in the harness. 11. On the wireless receiver (it says receiver on a label), attach the red wire to the purple wire coming out of the plug. 12. Plug the yellow video RCA male plug from the wireless receiver into the female RCA plug you attached in steps 8, 9. Use duct tape to tape them together so they don't wiggle loose. 13. Now identify the black wire going to the wireless receiver, and the wire you attached in step 10. 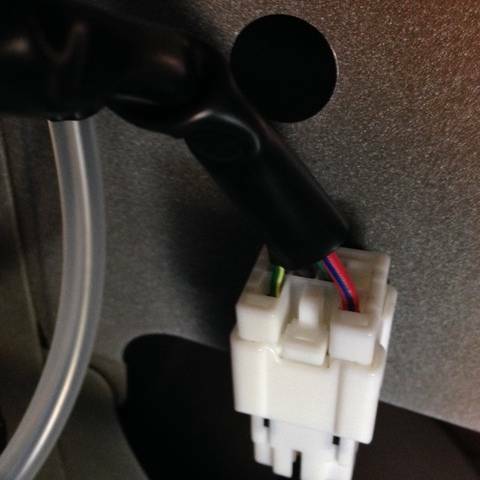 Twist the ends together and attach to a crimp connector or just get them ready to attach under a screw when you put the radio back in. 15. 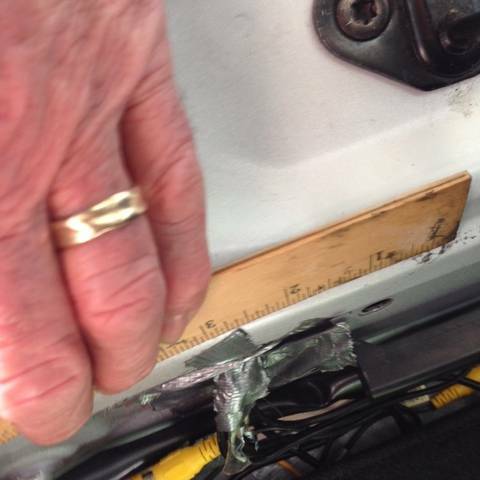 Pick up the panel, position it so that it is 1-2 inches away from the dash, reinstall the emergency blinker connector, be sure the 2 hooks on either side of the panel are in their slots, and snap the upper edge of the panel in place, then the lower edge. DONE WITH THE NAV RADIO PANEL WIRING . Take a break. You are about 1/2 done. INSTALLING CAMERA AND TRANSMITTER AT REAR OF CAR. 1. Lift hatch and remove the rear carpet and carpet pad. Remove the center trim panel at the rear lip of the trunk, it is the piece that has an opening for the hatch ring. It has 2 plastic buttons that pry out. Be careful to lift the trim piece UP after removing the button pins to release the hooks. 3. Take the camera and a 10" strip of duct tape and wrap the tape around the camera leads to protect them from the sharp edges of the hole you drilled, then, from outside the car, insert the camera leads into the space above the licence plate and through the holes so that the connectors are inside the car. 6. Now take the transmitter power leads and connect the red wire to the red/purple wire on the connector. Attach the black to black. 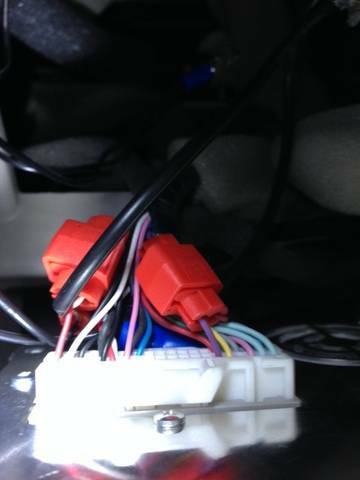 The Red/purple is the wire that carries +12 volts only when the shifter is in reverse. 7. Push the connector back into the metal of the car. 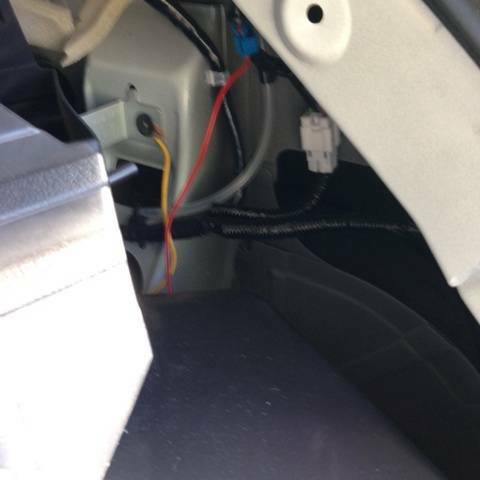 Replace the rear quarter panel trim and EVSE bag ring, threading the transmitter wires under the quarter panel. 8. Plug the transmitter into the power connector you just attached to the harness and plug the camera connector into the transmitter. Connect the yellow video connections. Tape the connectors so they don't wiggle loose as you drive. 9. 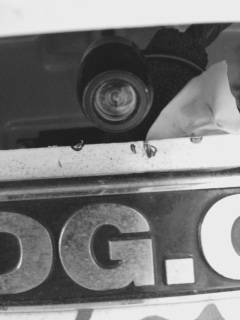 You need to bend the camera mounting clip so that when the clip face is glued to the inside wall of the licence plate support that the camera faces down at about a 45 degree angle. The camera will probably need to be reoriented so that up is up on the display. Reconnect the battery negative lead, put the parking brake on firmly, and put the car in run. Shift into reverse. The radio should show the camera view. Now hold the camera so that the metal clip is oriented in the position it will be when glued in place and check the view on the display. Unscrew the black plastic ring around the lens slightly so that the camera body can be rotated, and rotate it so that up is up on the display when the camera mounting clip is properly positioned. Tighten the ring when correct. 10. Turn off car and check desired location of camera. 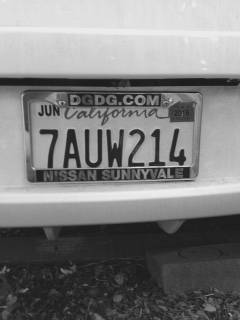 I superglued the metal clip to the inside wall of the licence plate plastic, seems easy and perfect. Be sure you measure so that camera is at the exact center of the car. 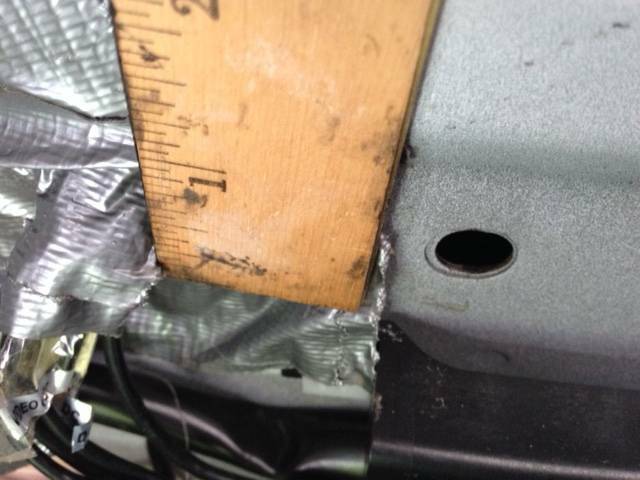 11. duct tape the hole on the inside of the car, so that the camera wires are not touching the sharp metal of the hole. 12. 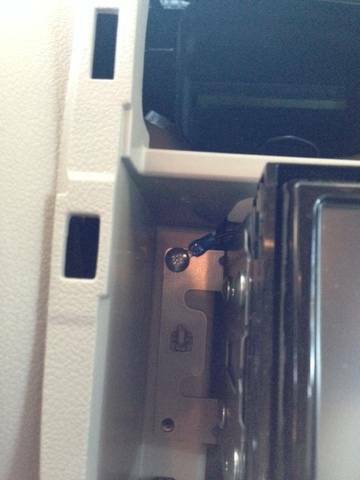 Tape the transmitter to the plastic just inside the space between the rear of the quarter panel and the rear lip of the trunk, with the antenna horizontal (to match the horizontal antenna orientation of the receiver above the glove box). Dress the wires so that they are not dangling all over and replace the rear middle trim. 13. Wait about an hour for the superglue to harden, and if necessary, bend the bracket so that the camera is pointing down at about a 45 degree angle. 14. Restart the car, put in reverse and check that all is working and that up is up on the camera view. I wrote this from memory, so let me know if I skipped any steps or where my instructions aren't clear. Great write up! Like you my wife and I both have 2013 SV Leafs gotten 1 week apart. I have a couple questions. 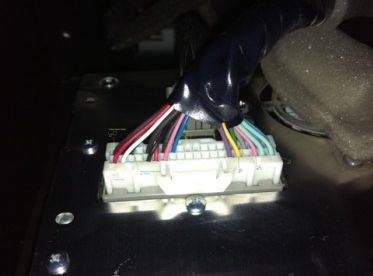 First, I found another backup camera mod https://youtu.be/_MPUkloBr2A and they spliced into the wiring at the harness near the panel near the driver's feet. Is there a reason or advantage splicing into the system at the back of the radio/nav unit as opposed to there? Also, they used a camera that didn't have superimposed guidelines. Did you use the one with or with the guides? I'm cheap and lazy. I used an aftermarket camera bc it is much cheaper and simpler to install, don't have to deal with all the hatch trim and wiring. I used a transmitter so that I wouldn't have to run wires from the back of the car to the front. The camera I got does have the superimposed guidelines, which I find complement the Leaf lines that show up. I spiced into the space behind the radio bc I didn't know there was another way. However, If you use a transmitter, I don't think it would get a good signal at the area behind the drivers kick plate. This is a great write-up. Can you draw a wiring diagram as well. Trying to follow the words and I am a bit confused. Thanks. Awesome write-up. I'm very likely going to do this as well. With a little time under your belt, how happy are you with the operation? Any downsides? Things you'd do differently? Issues with it working right or anything else? Great write up, I thought the 2012 would be similar but the wires are completely different. I have the camera in the back hooked up identically and will try the head unit or drivers kick plate in the future when I know what I am doing. The system works exactly as it did when I installed it. About the same time I installed a similar system in my S, but changed out the stereo to get a bigger display (the S radio has a much smaller display than the SV). I also seemed to have more static on my S installation than my wife's SV, so I took out the transmitter on my S and hardwired the camera to the radio. I've also done more work on my S (added backup ultrasonic distance system and ultrasonic blind spot monitoring) so am more comfortable with running wires from the back to the front of the car. I have found that in rainy weather that the camera lens sometimes gets a water drop on it, distorting the image a lot. I still wouldn't do it differently than the writeup, but if you live where it rains a lot, and you don't mind all the hatch trim work, you might install the camera higher up, perhaps under the hatch handle. The image is a little cleaner with the hard wiring on my S than the transmitter images on my wife's SV. I might run wires rather than use the transmitter solution if I had it to do over again. 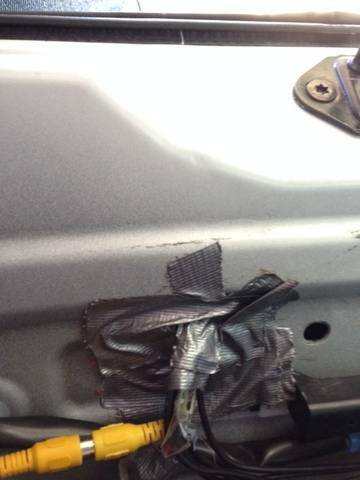 Is the duct tape holding up? Gaffer's tape is usually better in the heat. Would it be possible to get the "official" trim bit that the stock camera uses and install this one up higher? It would look cleaner for one thing, but also would protect from the rain. Is it an issue of finding power higher up? Not having a backup camera is really bothering me and I'm just trying to make a plan. I install same radio camera on my 2013 SV according your post, but video on the monitor is blinking. Were can be a problem? How you connect (-) on the back camera? or (-) must be connected to the ground (like on your pic. with yellow wire)? is it correct?